In our increasingly digital world, businesses of all sizes are looking at how they can transform their organizations—to create greater efficiency and streamlined business processes, to empower their workers with relevant insights, anywhere and on any device, and to scale and grow securely through the power of the cloud. With Dynamics NAV 2018, you can choose cloud or on-premises deployments, giving you the flexibility to determine what is best for your business. Upgrading your solution also keeps it running smoothly with the latest advances in technology and infrastructure, so you can maximize your existing investment in other Microsoft products and services. Dynamics NAV 2018 is even faster to implement, simpler to use, and provides you with all the power you need to support your business ambitions. Upgrade to Dynamics NAV 2018 and extend the value of your solution to more users. Now you have greater flexibility and more choice over how you access and deploy the solution. With new streamlined, easy-to-use native apps, you can enable mobile workers on any device—phones, tablets, and mouse and keyboard—running Android, iOS, or Windows. Empower more employees with straightforward and secure access to relevant information and data in Dynamics NAV— without having to invest in complex customizations or technology. Choose from deployment options on Microsoft Azure, in a private cloud, hosted by a Microsoft partner, or on your servers. Increase business insight with pre-built Microsoft Power BI dashboards and data connections that give teams instant access to key performance indicators in an intuitive environment, designed for secure collaboration. In Dynamics NAV 2018, you can connect to your instance of Dynamics NAV and PowerBI.com and immediately access the business performance dashboard, with insights into your business. The new PowerBI.com content pack for Dynamics NAV is designed specifically for small and mid-size business owners, managers, and executives, providing details on customers, sales, and finance. With build-in automatic refresh of data you always have the latest data at your disposal. With Dynamics NAV 2018 it’s even easier to grow sales, improve customer service, and streamline order-to cash-processes through native integration with Dynamics CRM Online. There is no longer a need to distinguish between CRM and ERP—it’s just one seamless workflow for your business processes. Whether you are working in Microsoft Dynamics NAV or Dynamics CRM, you can access the business information you need, from the product you prefer. The seamless experience means that you can increase sales and order accuracy, and decrease the time from a sales lead to receipt of cash from a customer. Your business management solution is a critical part of your organization and keeping it up-to-date is essential to the future of your business. By taking advantage of new functionality and enhanced capabilities available in recent releases, you can boost productivity, reduce costs, and improve customer service. Already known for its compelling financial, cash flow management and cost accounting capabilities Dynamics NAV 2018 delivers even more. Handling deferrals of revenue and expenses is made easy, and the posting preview feature enables you to control the end result up front. You can also ensure accuracy and reduce fraud with the new positive pay feature, and improve efficiency and save time using the Word format defaults for various reports. Digitize your business with expanded document management, workflow, and Optical Character Recognition (OCR) capabilities designed to help you automate processes and eliminate paper-based transactions, as well as providing updated currency exchange rates. With Dynamics NAV 2018, Microsoft announced a partnership with Lexmark to provide an invoice capture service hosted on Azure. This means that unstructured data from PDFs or scanned invoices and credit memos can be extracted into structured data, enabling further automatic processing similar to electronic documents. This service is available at no additional cost for the first 75 invoice transactions per Dynamics NAV customer. You can also accelerate your invoice approvals because with Dynamics NAV 2018 you automatically have access to the Tradeshift.com e-invoicing solution, at no additional cost. Documents can be sent to and received from organizations or government authorities via Tradeshift, and the delivery status and activity logging is available in Dynamics NAV for the document exchange service interaction. Upgrading your solution can help lower IT costs by making it easier to integrate your Dynamics NAV solution with other systems, including the other Microsoft products and services that you already have. 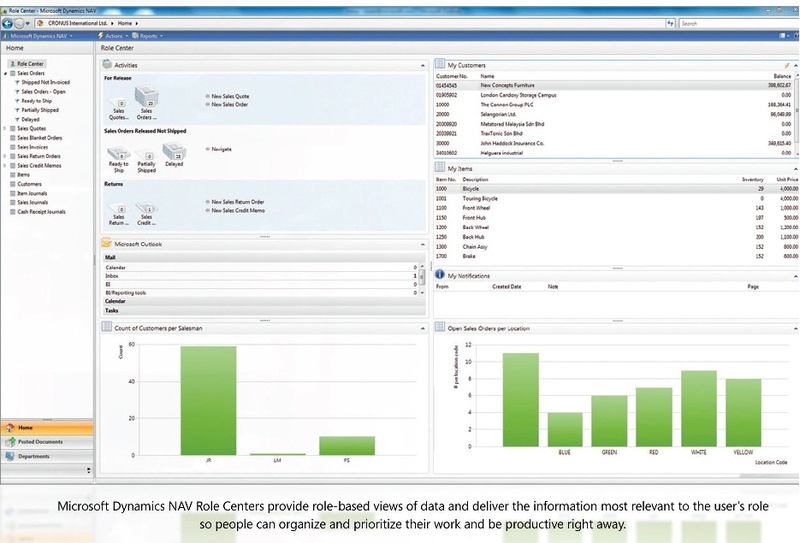 Dynamics NAV 2018 delivers integration enhancements and even closer alignment with Microsoft SharePoint and Office 365. And take advantage of enterprise-class scalability, security, and availability in the cloud with the new option to deploy Dynamics NAV on Microsoft Azure SQL Database, Microsoft’s industry-leading database-as-a-service in the cloud offering. With more than 60 enhancements to the Web client, you can accomplish even more with Dynamics NAV 2018. You can experience improved page and list navigation, and a significantly shorter start-up time when launching Dynamics NAV in a web browser. Yes, that’s right. If you upgrade your solution to Dynamics NAV 2018 now, you can help reduce the cost of future upgrades. Keeping your solution current—with the latest technology and functionality—is smart for your business and your bottom line. then you should consider upgrading to Microsoft Dynamics NAV 2018 so you can further improve your business operations and enhance your business processes. Why you should upgrade As part of Microsoft’s Support Lifecycle, each product has a five year mainstream support, or for two years after the successor product is released, or whichever is longer. When the version of Microsoft Dynamics NAV reaches the end of its mainstream support period, other elements of the infrastructure such as SQL Server, Windows Server and other relevant software components will be due for an upgrade in order to take full advantage of evolving hardware and software capabilities. This provides businesses with a great deal of predictability enabling them to manage their investment and IT resources. Upgrading to Microsoft Dynamics NAV 2018 – what’s in it for us? The questions we are most commonly asked is ‘what’s in it for us’ or ‘how will this benefit my business’. As part of Microsoft’s commitment to innovation, they have significantly invested in the Microsoft Dynamics NAV business management system to provide better capabilities, features and functionality. Some of these features and enhancements include Financial Management, Manufacturing, Supply Chain Management,Business Intelligence and Reporting, Sales and Marketing, Service Management and Project Management. To find out more about the latest features and to compare your current version of NAV to Microsoft Dynamics NAV 2018. Powered by Honki Solutions Ltd.